Last night a few of us from SVML went to the Todd Rundgren concert. He looked and sounded great, the band was tight and energetic and the crowd was having a good time. We had a blast. What really hit me was the evidence of Buffalo’s ongoing renaissance. Its once defunct waterfront looked alive and inviting. Historic buildings have been renovated and the fusion of old and new architectural elements is successful. The beautiful old cobblestone roads have been restored and new walkways and roads have been built where necessary. Brightly colored Adirondack chairs dot the green grassy park area. The sleek sailboats and colorful kayaks filled the river entrance to Lake Erie. 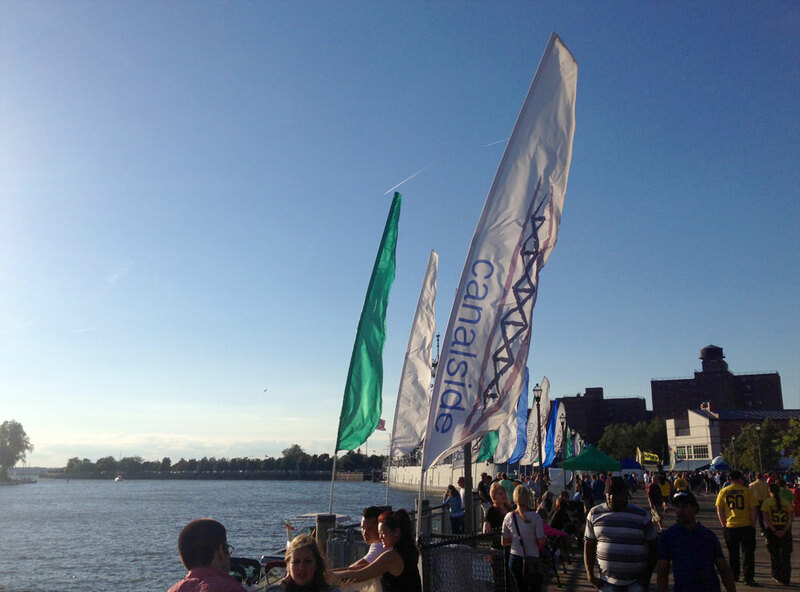 And the bright flags emblazoned with the Canalside logo (which is nice) fluttered in the lake breeze. Seeing all those elements come together as a fresh Canalside brand made it exciting to be there. You felt like you were someplace special, as though someone (or a lot of someones) cared enough to invest the time and money into creating a new identity and brand. If they cared enough to put forth this effort, then it must be worthy of taking part in. That’s the importance of a strong, well thought out identity. When it looks good it feels important. And that makes people feel good. When you make them feel good, they remember. The other day I stopped at the bank drive-through teller. As is most often the case, I had my dog, Bodi, with me. Bodi is accustomed to receiving lovely little dog cookies from the canister that shoots down from the vacuum tube. However, on this particular day, there was a new teller who had not been trained to give my dog his treats. This was a perfect analogy for any business. This brief exchange with my dog somehow gave me a new insight into how we market our clients’ business as well as our own. Questions we always ask are, “How is the best way and where are the best places to be seen?” If a business isn’t visible, how can it reap any rewards? And I can assure you, Bodi will be making sure he’s seen the next time we’re at the bank.